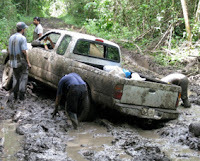 At the end of May I went to Belize to work at a Maya site out in the jungle for three weeks. 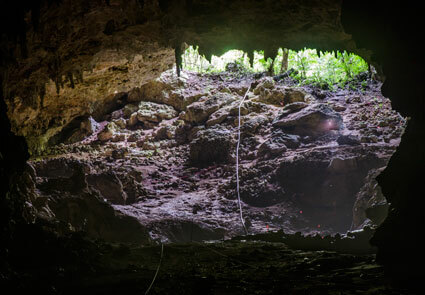 The site, originally referred as “Awe Caves”, is a medium-sized Maya ceremonial center located in the western part of Belize. It is of particular interest because a large cave with an extensive dark zone tunnel system resides directly beneath the largest temple in the site core. The project of 3D documentation and reconstruction of this site is part of a larger research project of preliminary investigation started in the summer 2011 and directed by Holley Moyes, UC Merced. The first year some 3D documentation of the excavations was done by Fabrizio Galeazzi, UC Merced. 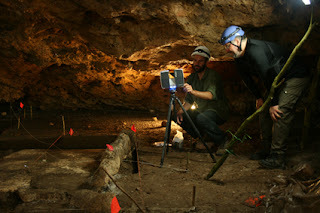 This year one of the ambitions was to 3D-scan the complete cave. 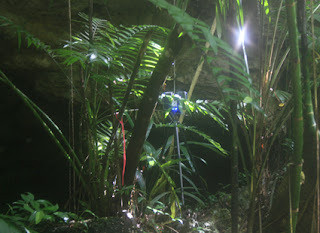 The cave is a natural geological structure, but has been divided into nine chambers in succession, by the Mayan people. The cave turns around so that the last chamber enters into the first, about 10-15 meters up on one of the walls in the entrance chamber. The different division of the chambers varies from clearly manmade structures to more or less natural boundaries. The 3d scanning was done with a Faro Focus 3D scanner. It is a small and compact scanner, that is easy to carry and has everything needed to scan built in. Faro Focus 3D including tripod, weighs about 8 kg and is therefore the ideal scanner for a mission of this kind. 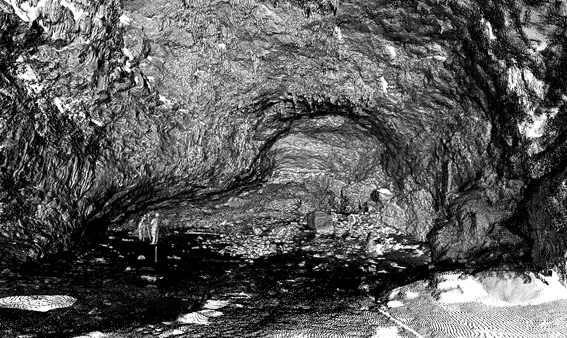 One important benefit from the small format of the scanner is evident in the fact that the scanning of the complete cave were made in just eight days. Right from the beginning it was decided not to try to capture color information in the cave, but only settle for the geometry. To capture color information would demand large amounts of lights to illuminate the cave properly. Bringing enough lights and spending time placing them as good as possible would have been a huge and costly task far beyond the scope of the project. At the start of the campaign, a fairly normal scanning strategy for larger structures was applied. This was a relatively efficient approach in the entrance chamber, but further into the cave it got more and more difficult. With such an extremely irregular geometric structure found in the cave, the risk to miss important parts was much larger than usual. So after a few days the scanning strategy significantly changed and scanning positions were moved closer together to be sure to cover as much as possible. It culminated in the fifth chamber, which was a complete jumble of rocks, stalactites, stalagmites, narrow cavities and hidden structures. This complex geometry led to a scanning strategy, in which the different scan positions were placed only a few meters from each other. This of course gave us a huge amount of scans that, at this writing, still isn’t fully post processed. Another objective of the scanning campaign was to verify how well the scanner handled the very special climate prevailing in a place like this. This is subtropical jungle and the work were made during a time of year when it was quite a lot of rain, high humidity and relatively warm. Inside the cave the temperature was slightly lower, but the humidity was significant. Anyone who has worked with electrical equipment in these conditions can tell you that humidity plays tricks with equipment that does not occur in dryer environments. We were pleased to see that the scanner handled these conditions well for most of the time. The battery ran out faster than usual, but that was expected. The only problem experienced was that the touch panel of the scanner stopped working on a number of occasions. The touch panel is mainly used to adjust the settings for the different scans, such as resolution or whether the scan should be done with color or not. Once these settings are made, the need to use the touch panel is not that big, with the very important exception of starting each new scan. Hence a non-functioning touch screen could be a serious problem. Fortunately, the scanner also provides a more stable button under the touch screen, which can be used just to start scans if you cannot start them otherwise. That saved a lot of time, since the only way to get the touchscreen to work again was to turn the scanner off and let it rest for a couple of hours. To prevent problems with humidity, the scanner bag was equipped with several small bags of silica gel during the entire period in Belize. It is used as a desiccant to control local humidity and may have done some good in keeping the scanner in such a good shape. All in all it was a very interesting trip and we are really looking forward to have time to work with the data. Cool project done by all of you. Scanning in jungle awesome. The project and other things is great here. The easiest way to get this projects into Eclipse is to do the following. In Eclipse, go to the File menu, select the Import option, expand the Android folder, select Existing Android Code into Workspace. Thanks for sharing this amazing blog. We use a Faro Focus 3D scanner to do the 3d scanning activities and this service can be provided only by professional companies. I like your blog it is very helpful and informative.